Distance (16 inches). +1 Damage. Throw. An enemy unit within Reindhold's Control Zone loses 4 Life Points. Each additional Action Point adds +1 to the Effect and 1 additional loss of a Life Point. Effect 14. 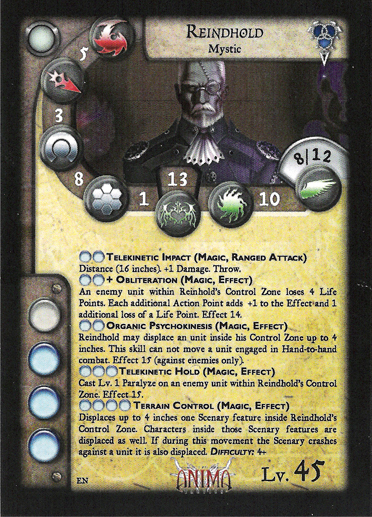 Reindhold may displace an unit inside his Control Zone up to 4 inches. This skill can not move a unit engaged in Hand-to-hand combat. Effect 15 (against enemies only). Cast Lv. 1 Paralyze on an enemy unit within Reindhold's Control Zone. Effect 15. A part of Team Les Jaeger along with Kirsten, Kyler and The Colonel. [09/06/2008]If a Character is struck by terrain being moved by Reindhold's "Terrain Control" Ability, they do not suffer crash damage. Lord Alfred Reinhold, descendant of one of the oldest and most influential noble houses of Togarini, is one of the most important members of Les Jaeger. Gifted with powerful psychic powers, this old man is able to move mountains with the power of his mind.